This talisman was made for love, attracting luck, beauty, and joy. THIS RING TALISMAN WILL BE AVAILABLE AGAIN IN JUNE 2019. AVAILABLE FOR PRE-ORDER, BUT THE RINGS WILL BE CONSECRATED ONLY IN JUNE. The ring is made of 925 sterling silver and is adjustable to fit different finger sizes. 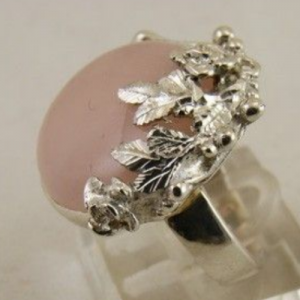 The gem is a natural Brazilian PINK QUARTZ of VENUS and it’s size is 18 mm diameter. Every gemstone is unique, so the colours can slightly vary from what you see on the picture. The magic symbol and character of Venus will be engraved in the back/down side of the gem, so that they remain secret for the public eye, but will touch the finger. This ring will be handmade and is a unique model from the collection of a famous Bulgarian jeweler. This talisman was made for love and attraction between two people. It was ritually consecrated on the following elected astrological timing: 27 April 2018. The ring is made of 14 carat gold and 925 sterling silver and is adjustable to fit different finger sizes. 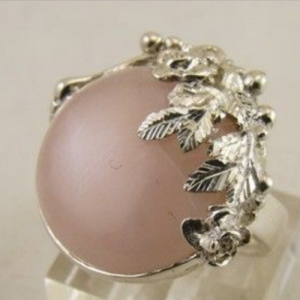 The gem is a natural AAAA quality Brazilian PINK QUARTZ of VENUS and it’s size is 18 mm diameter. Every gemstone is unique, so the colours can slightly vary from what you see on the picture. It was made and consecrated on the following elected astrological timing: 13 December 2018. The ring is made of 925 sterling silver. The size of the stone is around 19mm. The gem is a natural untreated LAPIS LAZULI of VENUS with beautiful silver pyrite inclusions. The magic symbol and character of Venus will be engraved in the back/down side of the ring, so that they remain secret for the public eye, but will touch the finger. This ring is handmade and is a unique and only model. This talisman will be made for love and attraction between two people. It will be made on the following elected astrological timing: 13 December 2018. The ring is made of pure solid 24 karat gold (100% gold without inclusions) and 1000 (100% with no inclusions) sterling silver and is adjustable to fit different finger sizes. The gem is a natural of around 3 karat untreated hand cut PINK TOURMALINE of VENUS. Every gemstone is unique, so the colors can slightly vary from what you see on the picture. The diameter of the gem is around 1cm; so, on the picture may appear a bit bigger. The magic symbol and character of Venus will be engraved in the back/down side of the ring, so that they remain secret for the public eye. This ring is handmade by famous Israeli jeweler. 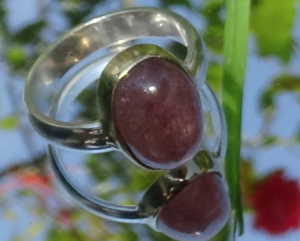 The gem is a natural PINK-PURPLE AMETHYST. The sizes of the gem are 13 x 13 mm. The gem is a natural very large of around 10 karat untreated PURPLE TOURMALINE of VENUS. Every gemstone is unique, so the colors can slightly vary from what you see on the picture. The sizes of the gem are 16/10/5 mm. The ring is made of 1000 (100% without inclusions) sterling silver and is adjustable to fit different finger sizes. The gem is a natural very large rectangular untreated PURPLE TOURMALINE of VENUS. Every gemstone is unique, so the colors can slightly vary from what you see on the picture. The gem is a natural very large round faceted untreated RUTILE QUARTZ of VENUS of supreme AAA quality. The gem is very large around of 17mm diameter and 5mm height. The cuff is made of 925 sterling silver and copper and is open to fit different hand sizes. The gem is a natural very large rectangular untreated agate of VENUS. Every gemstone is unique, so the colors can slightly vary from what you see on the picture. The magic symbol and character of Venus will be engraved in the back/down side of the gem, so that they remain secret for the public eye. This cuff is handmade in Afghanistan. It was made and consecrated on the following elected astrological date: 20 july 2018. How exactly this talisman was created you can read HERE. The ring is made of 18 carat gold and sterling silver. The gem is a natural untreated pink STRAWBERRY QUARTZ of VENUS from Brazil. Every gemstone is unique, so the colours can slightly vary from what you see on the picture. This pendant is handmade and is a unique model from the collection of a famous Bulgarian jeweler. This ring is only one of a kind. This talisman was created and consecrated for love and attraction between two people. It was made on the following elected astrological timing: 20 july 2018. The gem is a natural untreated PINK EMERALD- MORGANITE of VENUS from Zimbabwe. Every gemstone is unique, so the colours can slightly vary from what you see on the picture. It will be made on the following elected astrological timing: 20 july 2018. The pendant is made of 18 carat gold and sterling silver. The gem is a natural untreated PINK TOURMALIN of VENUS from Afghanistan. Every gemstone is unique, so the colors can slightly vary from what you see on the picture. The gem is a natural untreated AAAA quality PINK EMERALD- MORGANITE of VENUS from Zimbabwe. Every gemstone is unique, so the colours can slightly vary from what you see on the picture. The ring is made of 18 carat gold. 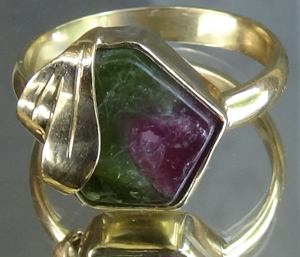 The gem is a natural untreated WATERMELON TOURMALINE of VENUS from Afghanistan. Every gemstone is unique, so the colours can slightly vary from what you see on the picture. Thering is made of 18 carat gold. This ring is handmade and is a unique model from the collection of a famous Bulgarian jeweler. This ring is only one of a kind. The pendant is made of 18 carat gold.